While diplomatic maneuvering continues over Turkish bases and a new United Nations resolution, inside Iraq, U.N. arms inspectors are privately complaining about the quality of U.S. intelligence and accusing the United States of sending them on wild-goose chases. CBS News Correspondent Mark Phillips reports the U.N. has been taking a precise inventory of Iraq's al-Samoud 2 missile arsenal, determining how many there are and where they are. Discovering that the al-Samoud 2 has been flying too far in tests has been one of the inspectors' major successes. But the missile has only been exceeding its 93-mile limit by about 15 miles and that, the Iraqis say, is because it isn't yet loaded down with its guidance system. The al-Samoud 2 is not the 800-mile-plus range missile that Secretary of State Colin Powell insists Iraq is developing. In fact, the U.S. claim that Iraq is developing missiles that could hit its neighbors – or U.S. troops in the region, or even Israel – is just one of the claims coming from Washington that inspectors here are finding increasingly unbelievable. The inspectors have become so frustrated trying to chase down unspecific or ambiguous U.S. leads that they've begun to express that anger privately in no uncertain terms. U.N. sources have told CBS News that American tips have lead to one dead end after another. Example: satellite photographs purporting to show new research buildings at Iraqi nuclear sites. When the U.N. went into the new buildings they found "nothing." Example: Saddam's presidential palaces, where the inspectors went with specific coordinates supplied by the U.S. on where to look for incriminating evidence. Again, they found "nothing." Example: Interviews with scientists about the aluminum tubes the U.S. says Iraq has imported for enriching uranium, but which the Iraqis say are for making rockets. 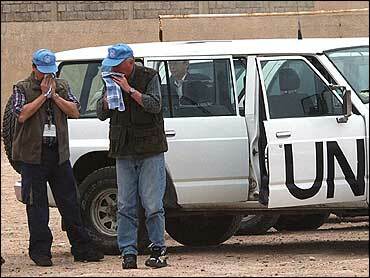 Given the size and specification of the tubes, the U.N. calls the "Iraqi alibi air tight." The inspectors do acknowledge, however, that they would not be here at all if not for the threat of U.S. military action. So frustrated have the inspectors become that one source has referred to the U.S. intelligence they've been getting as "garbage after garbage after garbage." In fact, Phillips says the source used another cruder word. The inspectors find themselves caught between the Iraqis, who are masters at the weapons-hiding shell game, and the United States, whose intelligence they've found to be circumstantial, outdated or just plain wrong. Meanwhile, the U.S. and Britain are planning to present a new resolution to the U.N. Security Council on Monday in a bid for support to use force to disarm Iraq. Finishing touches were being put on the resolution on Thursday. Adoption is by no means assured. A majority of the 15 council members are opposed to war at least until U.N. weapons inspectors report in mid-March. Secretary Powell said a headcount was "academic" because the resolution demanding Iraqi disarmament had not been put forward. Powell, who flies to Japan on Friday for the start of a five-day Asia trip, juggled resolution diplomacy with stressful negotiations with Turkey, a potential key ally in any war. Turkey is balking at U.S. terms for an economic aid package. Powell, who interceded on Wednesday with Prime Minister Abdullah Gul, said he had told the Turkish leader "our position was firm with respect to the kind of assistance we could provide." However, Powell said, "there may be some other creative things we can do." As for the expected U.N. resolution, the Bush administration sees little value in extending inspections and much to worry about in Iraq's connection to al Qaeda and other terror groups. Powell said, "We won't put a resolution down unless we intend to fight for the resolution, unless we believe we can make the case that it is appropriate." In Baghdad, meanwhile, Iraq allowed another flight by an American U-2 surveillance plane Thursday as President Saddam Hussein's government sought to convince the world that it is cooperating with the weapons inspectors. It was the second flight this week by a U-2 in support of the U.N. inspection program. The Iraqi Foreign Ministry said the plane spent six hours and 20 minutes over Iraq's territory, searching for evidence of banned weapons. In regard to the possible basing of U.S. troops in Turkey, Gul said in Ankara that a statement would be made on Friday. He did not elaborate. Powell did not elaborate on the refinements under consideration, but another U.S. official said one approach might be to seek a $1 billion congressional appropriation that would then permit Turkey to obtain loans at preferential U.S.-government rates for many times that amount. Ships carrying equipment for a U.S. infantry division are already at sea. The United States wants to base tens of thousands of soldiers in Turkey to open a possible northern front against Iraq. The dispute with Turkey is one of many problems the Bush administration has as it tries to line up support for an attack on Iraq if Saddam doesn't disarm quickly. Implying the United States might deploy troops elsewhere if terms could not be reached with Turkey, White House spokesman Ari Fleischer said "we have to deal with realities, and we will." Meanwhile, President Bush sought to keep the pressure on the Security Council, telling a suburban Atlanta audience, "Denial and endless delay in the face of growing danger is not an option." The president has said the council risks irrelevance if it does not face up to Iraq's defiance of more than 10 years of disarmament resolutions. Mr. Bush also has said if the council does not approve a second resolution he is prepared to go to war with a "coalition of the willing" — nations like Britain that agree with him that Iraq's arsenals of biological and chemical weapons pose a threat. Mr. Bush planned to host Prime Minister Jose Maria Aznar of Spain, an ally, at his Texas ranch Friday and Saturday. Another potential ally, Prime Minister Simeon Saxcoburggotski of Bulgaria, is due next Tuesday at the White House.